Let's go waltzing in Paris! The venue has a 280m² beautifully parqueted dance floor, for a memorable Viennese waltz party from 9pm to 3am. There will be a waltz initiation course for beginners from 21h to 21h30. 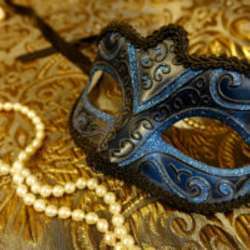 The masked ball will be dedicated to the Viennese waltz, and interspersed from time to time by rock music (on which you can dance the "Rock quatre temps" or the Jive). The Viennese waltz has the advantage that it can be danced on a wide range of music styles - from classical to modern music. There will be something for everyone. You will have the opportunity to drink, nibble and chat between dances around a buffet in an adjoining room. Suggested dress code: mask + evening wear. There is no strict dress code for this masked ball. The organisers are committed to offer you optimal conditions for dancing the waltz. The number of participants will be limited accordingly, so get your ticket as soon as possible! If you are going by car and can take others with you, please mention in the Comments section below how many passengers you can take with you. Others who would like to go as a passenger (and share the fuel costs) should also post a comment. Alternatively you can go by train or Flixbus that go several times a day between Brussels and Paris. Disclaimer: In accordance with InterNations activity guidelines, neither InterNations nor the organiser take any responsibility for any risk occurring before, during or after the event. You travel, eat, drink, dance and socialize purely on your own risk.